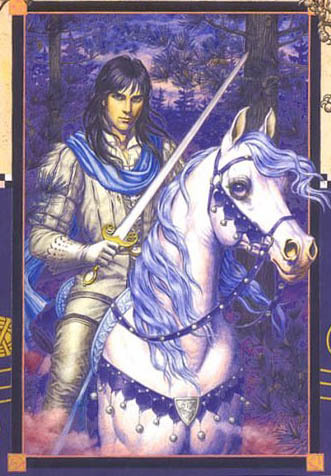 Mercedes Lackey's fantasy series about the Heralds of Valdemar and their allies. Picture from "The Valdemar Companion," ©Mercedes Lackey. Set 75 years after the founding of k'Valdemar Vale, the action takes place at the four Collegiums in Haven. we also have kyree, gryphons, Tayledras mages, and even a Sh'in'a'in warrior or two! You may create your own character, or adopt one of the many already begun. Either way, you must create your own character sheet. and several of the teachers and Deans in the Collegia. So peruse our pages, and don't hesitate to ask any questions. After all, isn't that what the Collegia are about...learning? Where wouldst thou care to travel, good gentle?